There is a good reason, I believe, that a large number of pickup trucks appear in this space: they are bar-none, the most capable type of tow vehicle. But, like sport utilities, vans and sedans that tow boats on weekends, trucks also have to serve the daily driving needs of their owners. 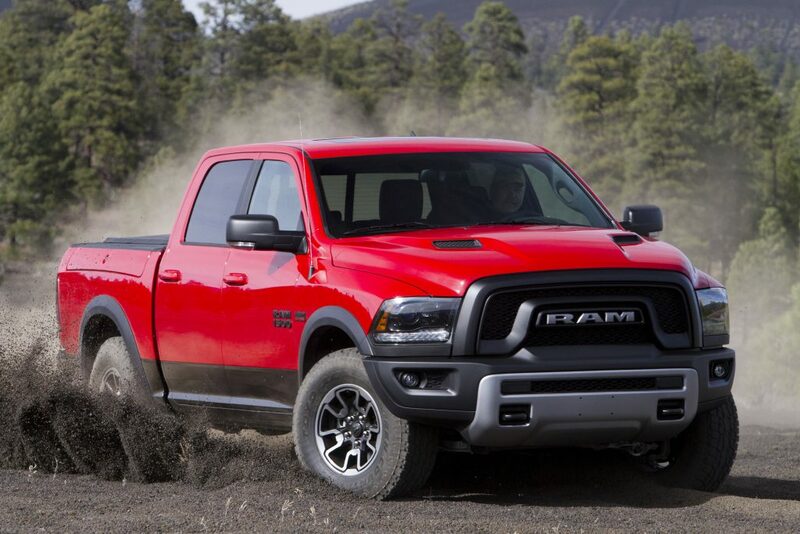 Then there are questions of matching a driver’s personality and driving style, which brings to mind the wide range of Ram trucks now available. The current Ram 1500 design is due to be replaced for 2018, but in the meantime has spawned a wide variety of models and variations. There are 11 models from the basic ST to luxurious Limited, powered by gasoline engines including the economical but capable 3.6 L Pentastar V6 and the legendary 5.7L HEMI V8, plus the fuel-sipping, torque-laden 3.0L EcoDiesel. For truck-lovers who want an off-road specialist, the Rebel is a Crew Cab 4X4 with Pentastar or HEMI power, skid plates, beefed-up suspension and 33-inch tires. Over the years, I have tow-tested V8, V6 and EcoDiesel versions. 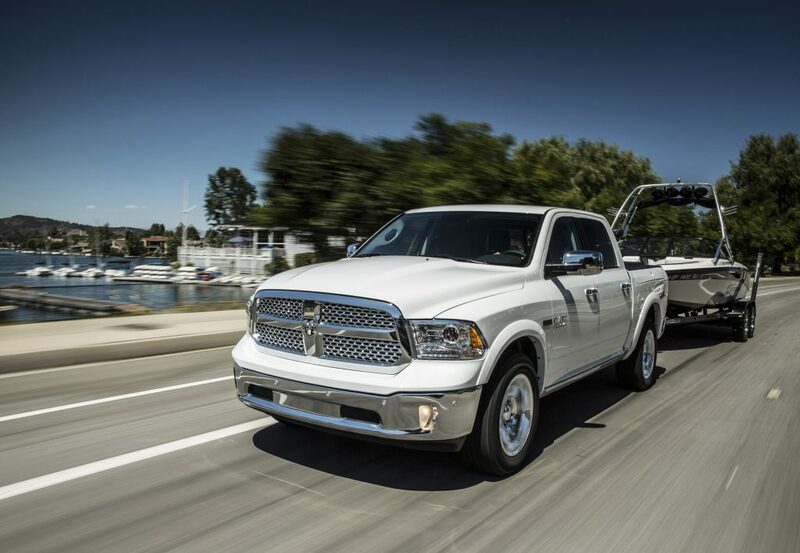 With tons of torque and light-load fuel consumption that’s comparable to compact cars, the EcoDiesel Ram 1500 is impressive. Last year, I tested a pair of HEMI-powered Rams. With 395-hp on tap, the HEMI is always responsive and has a pleasant throaty roar when pressed. It also provides reasonable fuel consumption thanks to MDS technology that cuts out cylinders when not needed. Other than the engine and Ram badges, the trucks had little in common. My Ram 1500 Sport Crew Cab 4X4 test truck was the model I would probably choose for serious towing, plus practical passenger and gear hauling. With an optional 3.92 rear axle ratio, it was rated to tow up to 10,330 lb, with a back-up camera for easy hitching, trailer brake control and a feature that logs your towing miles. Four-wheel drive is ideal for lousy launch ramps and Canadian winters. The other test truck was another matter entirely, a reminder that a truck can focus on fun, with little thought for work or people hauling. The Ram 1500 R/T regular cab 4X2—not a model but a variant in the Sport lineup—is a Flame Red truck with the heart of a sports car. It is unlikely to haul anything dirtier than a couple of sets of golf clubs and has a short box and bucket seats in the cab. The twin-vent sport hood and 22-inch wheels hint at its character. Once you’re behind the wheel, though, the R/T shows its mettle. 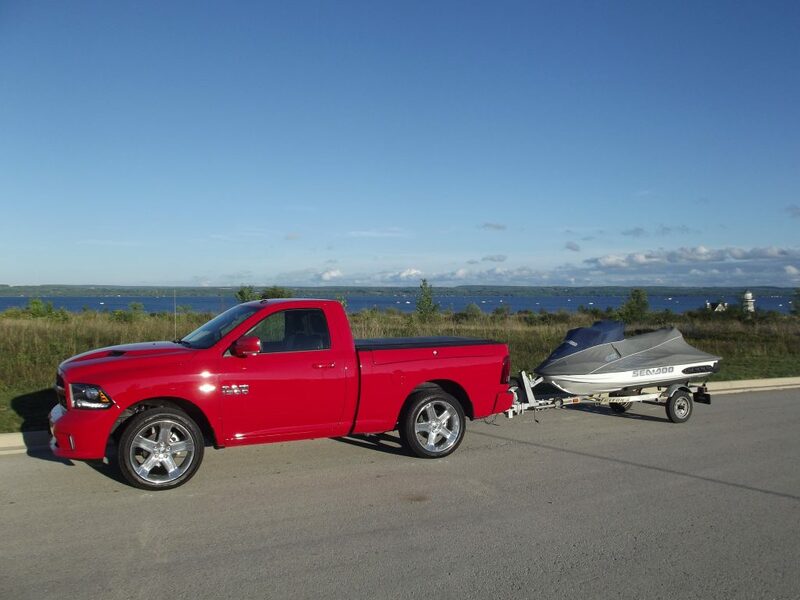 The HEMI V8, plus short cab and box combine to provide great acceleration and sporty handling (for a truck). The optional tonneau-cover and RamBox lockers add plenty of protected cargo space. And, the 5,030-lb tow capacity will handle PWCs or medium-sized boats. I hear that the all-new Ram truck design for 2018 to be unveiled this year is likely to include a larger cab. For those with big boats and plenty of gear, that will be fine and practical. 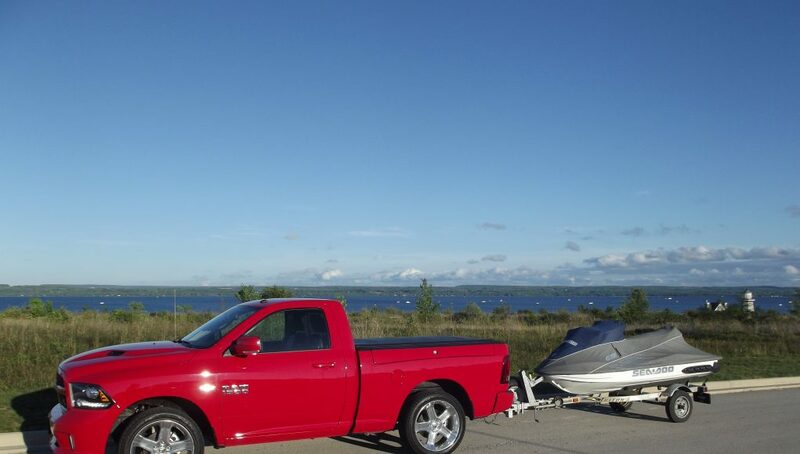 But I’m sure there will still be something for sporty truck folks who just want to have fun, on and off the water.